Aggregate Industries has proven its unrivalled credentials when it comes to providing a fast, flexible and truly innovative approach to road surfacing with its recent work at the A3 Kingston Bypass, South London. Constituting one of the busiest roads in South London, the A3 Kingston Bypass has been resurfaced in a bid to deliver a more reliable and cost-effective highways service across the Capital. Working with the main contractor, Kier Highways on the project, Aggregate Industries South East Contracting and Southern Asphalt were called upon to design a single layer surface course material that could replace the traditional binder and surface course pavement layers, whilst achieving the minimum surface texture required. In response the Aggregate Industries team designed a low temperature 20mm SuperFlex® surface course which could be laid in a single layer at depths between 100m and 130mm to achieve a minimum surface texture. With approval from Transport for London (TfL), a trial was completed and the project commenced early March during a; shorter than standard, restricted, night time working window (10pm and 5am). As with any trial, the material was vigorously checked during the pre-construction phase to ensure any concerns were immediately allayed. The material trial ensured that the material met the minimum surface texture of a 50mph road; would not deform in high traffic environment; and there were no issues with joints, cracking or rutting. As a result, Aggregate Industries’ contracting team got to work an average of 600 tonnes per night – with an unprecedented 700 tonnes layed on 15th March. Core to ensuring such a swift delivery, during each night shift two planers worked in echelon to remove the worn carriageway on the Bypass. Geotextile was installed prior to the SuperFlex® installation, with two local asphalt plants mixing the material to keep up with Contracting’s output requirements. 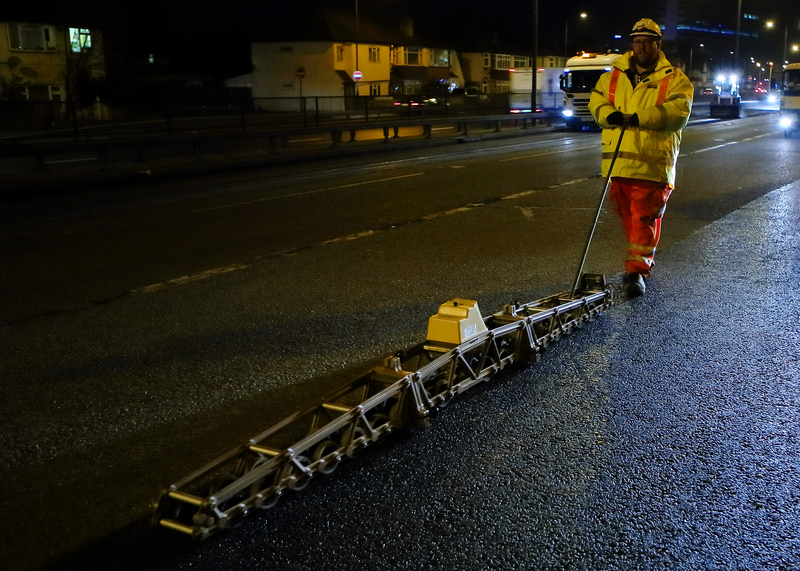 Also, using the new 20mm SuperFlex® instead of a traditional two course pavement treatment enabled the team to work quickly, alleviating disruption for the travelling public and nearby residents. "When working on projects of this calibre, with such complex requirements and acute deadlines, it is vital to work with partners who have the expertise and resource to deliver and Aggregate Industries has once again surpassed expectations. Through a combination of providing a bespoke SuperFlex® formula which enabled us to achieve a binder and surface course in one, through to their incredibly holistic contracting approach, the team have effectively achieved what would typically be 2.25 nights of resurfacing in one. We are extremely grateful."